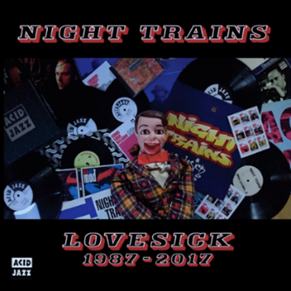 Night Trains celebrate their 30th anniversary with the release of Lovesick 1987 – 2017, a definitive guide to the Night Trains love affair with all things soul, funk and jazz. Released 21st September via Acid Jazz/PIAS, the album features 18 key tracks from the Night Trains discography, including the band’s most recent single, the horn-driven Do Anything You Wanna Do ft. Jennie Bellestar Matthias and the rare as hen’s teeth, underground club hit, Open Channel D.
Formed in 1987 by bassist, producer and DJ Hugh Brooker, Night Trains, along with Galliano, became part of the first wave of acts to be signed to Acid Jazz Records, a London-based label set up by British jazz champions, Eddie Piller and Gilles Peterson, and home to The Brand New Heavies, Jamiroquai and D-Influence. Originally an instrumental, sax and Hammond organ-led 5 piece, Night Trains first cut their teeth at the legendary Wag Club Monday night Acid Jazz sessions. The band’s first vinyl outing recorded for the label, was the limited edition Open Channel D, a sax-heavy funk track which proved a massive hit with club DJs. This was followed by a very early example of mash up breakbeat jazz on the track And Now We Have Rhythm, which later appeared on Acid Jazz and Other Illicit Grooves; the seminal release on Polydor’s Urban Records, alongside artists such as James Taylor Quartet, Galliano and Jalal from US hip hop pioneers, The Last Poets. Night Trains released their eagerly anticipated and critically acclaimed debut album Checkmate via B.G.P Beat Goes Public, and it became a huge underground hit, before the band returned to Acid Jazz Records in the early 90’s, releasing two more albums; Loaded (1992) and Sleazeball (1994), the latter featuring the international club hit Lovesick, a soulful, disco funk groove and the Night Trains’ most well-known track. Signing a US deal with Instinct Records in New York, Night Trains toured Europe and Japan headlining at venues such as The Jazz Cafe and the Marquee in London, Club Yellow Tokyo, Magazinni Generali Milan and the Paradiso and Melkweg Amsterdam, as well as touring with artists as diverse as Afrika Bambaataa, Jamiroquai and the late great Gil Scott-Heron. Always looking to keep the sound and vibe fresh, Brooker would constantly change the live and studio line-up of the band and a number of key musicians from the soul, funk and mod fraternity would perform with the band including Spider Johnson, Jennie Bellestar, Damian Hand, Mike “chilli” Watts, Tony Watts, Dave Priseman, Julian Bates and Gary Foote. Taking a break for Night Trains duties temporarily, in 1993, Brooker formed The Humble Souls with UK rapper and Fatboy Slim cohort, MC Wildski, which resulted in the album Thoughts and Sound Paintings (1993), again released on Acid Jazz Records. After a successful year of international promotion, he returned to work on the new Night Trains album Obstruct The Doors Cause Delay and Be Dangerous (1997). At the time, Acid Jazz records secured a major sponsorship deal for the band with legendary Italian fashion house Cerruti which resulted in various runway and TV appearances for the band across Europe creating extensive worldwide exposure. After a hiatus, Night Trains returned to Acid Jazz Records in the summer of 2012, with the 7” vinyl release of No More Heroes, a stomping northern soul reinterpretation of The Stranglers’ new wave classic. Three years later, the band teamed up with Back Burna Records and released the dancefloor filler Black Whip, before returning once more to their spiritual home at Acid Jazz Records with the release of ‘Lovesick 1987 – 2017’. Outside of Night Trains, Hugh Brooker DJs globally and has co-written, remixed and produced for artists as diverse as Sophie Ellie-Bextor and Earth Wind and Fire. After numerous releases on Acid Jazz and other various labels over the last 30 years, the band have gone full circle with the release of Lovesick 1987 – 2017 on Acid Jazz Records. The track premiere that we have here is a version of Do Anything You Wanna Do (instrumental), which does not appear on the album. The version that appears on the album is the vocal version. Click on this link to have a listen. If you would like to follow Love Trains you can so via their website. All words by Mat Mead. Further articles by Matt can be found at the Louder Than War author archive pages.